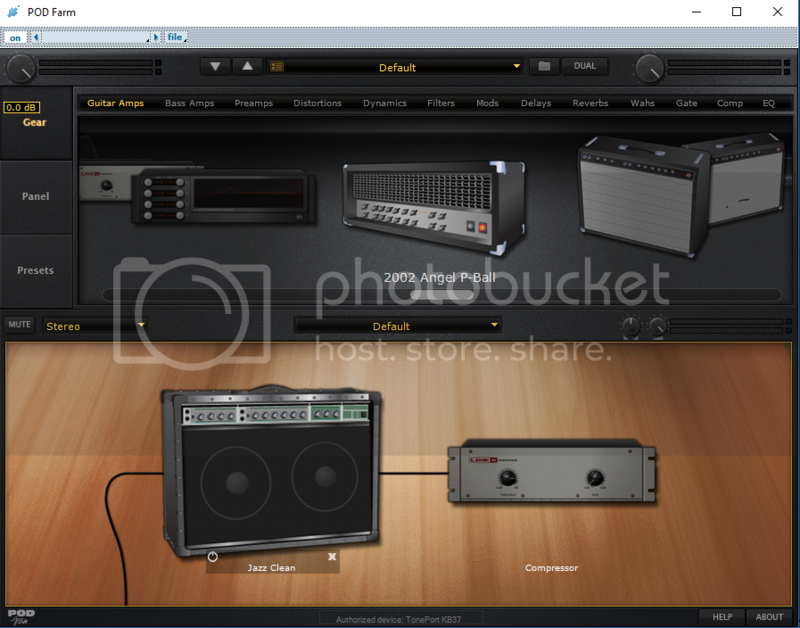 Home » [Cakewalk Products] » SONAR » Windows 10 & Audio Input volume. This helped me big time, so I thought I would share. AnsweredWindows 10 & Audio Input volume. This helped me big time, so I thought I would share. Windows 10 & Audio Input volume. This helped me big time, so I thought I would share. NOTE : Since I made this post if you read the whole thread a lot has changed since for me since posting this message here. I am not going to edit/delete because maybe it may help someone in the future. Originally I thought I had it all figured out. And thanks to a few comments and suggestions here it pointed me in the right direction to resolve my issue. If you already have a good enough input signal you probably should not attempt this because it could cause problems, I dunno maybe overload your input and tear something up. Not sure about all that but I thought I would mention it. First off, I use a Tone port KB37 and Windows 10 latest version. Although I suspect if you are using Windows 10 this may work for any audio device you are using for input to record with. May work with other Windows versions, not sure though. The KB37 doesn't come with a audio input volume control on it or in the software that controls it. Although I suppose I could always add something in front of the input to increase the volume, but I really don't have nothing to do that with except my small amp and even with it set to dry signal it just doesn't sound good. I also tried adding some gain plugins before my Guitar VTS's I use, but it never seemed to sound that good at all to me. For the longest time I have tried to record with this Toneport KB37 and the input volume has always been so low when recording that the Waves on the track looked paper thin and the audio never was quit loud enough. It was very frustrating. The KB37 has a PAD selection, I always kept it off for maximum volume and while it made a difference it was not that much. Anyway, I found a simple solution for my issue and thought maybe it might be useful to others with the same issue. I was looking in Control Panel/Sounds/Recording devices today, My levels were set all the way to 100 so that wasn't the problem. I noticed there is a "Custom" option for the recording device that has a "Microphone Boost" option, it was unchecked so I checked it and now all the sudden my volume is working great and the visual size of the Waves looks perfect, they are no longer paper thin. Now I have to turn down the output on my VST's I use for recording guitar a little, but it sounds so much better now. This may be something everybody already knows about, but I didn't know about it until today so I thought I would mention this for anyone using a KB37 or other device that might be having a similar problem. Here's an example of the difference it made in my setups case. 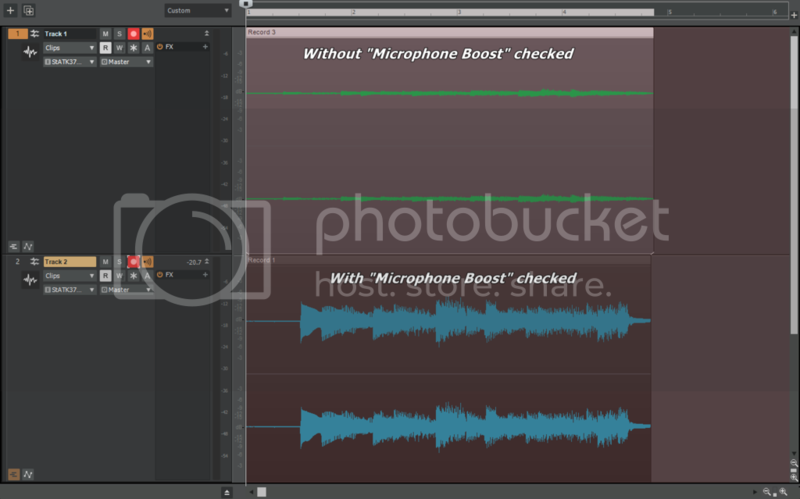 The mic boost is not in all PC sound systems. Some Realtek have it, I have Conexant on a Toshiba laptop that does not have it. But, most do not use the PC sound "card" as it can be noisy and most have poor latency. You should consider a recording interface unit with a built in preamp. Even the inexpensive ones have that. Much better for recording. Strange as it may sound, my PC does have a built in Realtek sound card, I have a XPS 8700 Dell PC, but the realtek is disabled in Bios and I am only using the Line 6 Toneport KB37. This seems to have worked for me. Although, if I ever get the money to do so I want to upgrade to a better audio input device. I also have a Tascam US122L, but it's buggy at best sometimes, a lot of line noise when I use that one for some reason regardless of what I have tried. I'm happy with this setup after making the Microphone Boost change, everything is working perfectly, and I do not notice any latency, but keep in mind, I'm not using a Realtek, I'm using the KB37 line 6. If I ever get the spare money I have been thinking getting a Focusrite, I've heard a lot of good and a lot of bad reviews, but I guess it's like everything else, sometimes somewhere in the process we all have bad days and end up with a lemon. Thanks for pointing that out about different PC's not having the Microphone Boost option. That's one reason I was mentioning "Not sure about that". I have a MOTU 8pre that I've owned for a long time that's been great, but I have a Focusrite Scarlett Solo that's sounds great and has been rock-solid on my laptop. Great performance and sound, I recommend them. Note that this box doesn't have a MIDI in/out. Obviously the Tone port does not use ASIO drivers otherwise Windows control panel would have nothing to do with it. Most of us use a proper Audio interface that comes with ASIO drivers. There is a GUI interface for settings and Windows has nothing to say about that. A proper interface will most certainly have a front panel Volume/Gain controls anything else is not a serious device for audio recording. Toneport should use ASIO drivers, Serious noize check your driver settings in Cakewalk preferences. Toneport has typical XLR preamps and ASIO drivers, I was recording with UX2 in the past, KB37 should not differ from it. It does use ASIO drivers. What you just said about the GUI interface actually has resolved the audio input issue I have had for a long time. Thank you! BUT : Installing the Pod Farm 1 standalone software that does have a "Mixer" section that has a +18 db selection to increase the input and volume control for the input, I clicked that and all my issues were solved, no Microphone Booster selected in Windows sound control panel at all this time. It didn't occur to me to look at the stand alone because I have always used the Pod Farm 1 VST, the VST does not have a Mixer selection. I don't know why they didn't add the Mixer section in with the other options you get when you just install the Drivers only. LOL!!! I should probably get the Dunce of the decade award for missing that one. Not really, as generally any hardware device ( audio interface) will have analog control ( level knob) over the gain. Otherwise you stand a chance of clipping the A/D converters which is not a pretty thing. Then there's the danger of low signals that will sound thin and wimpy. Gain structure is very important to good recording. In my mind once a signal has passed through a A/D converter anything you do to it is a digital process. Turning up a GUI mixer or applying gain to the track, it's all the same process. Best to have levels hitting that A/D at respectable levels. If that interface has no gain control then myself I'd be figuring out how to hit it harder using a stomp box or? better Pups? Sorry, I should have posted pictures of it and made things clearer. It doesn't have a "Hardware" input volume control for the dedicated Guitar/instrument plug in port, or the Line Plugins, but it does have Hardware knobs for the Microphone plugins on the device. What always confused me the most, if you look at the picture, if you can see it that is, there is a "PAD" on and off selection, which is meant to be used for guitars that have active pickups that are hot so you can tone them down where the volume goes, but if you just have a regular electric guitar with common pickups then you turn it off for your volume so it will be louder. I wasn't aware of the Mixer options in the Stand Alone Pod Farm 1 software because I had been using the VST which I mentioned in earlier comments here. Where I mention the "Click the +18 DB" in the Mixer section for the Standalone Pod farm 1 version which is not available as an option in the "VST" version. The problem is that if you just install the drivers only, you don't have the option to click "+18 DB" for weaker pickups on guitar and such and would think that the PAD function turned off would cover this problem considering there is no hardware input volume knob for the dedicated Guitar/Instrument port. What I am getting at is, while I get they added the quick "Pad" feature on the device, what I couldn't figure out is why they laid things out like they did. I mean, You'd think having a "PAD" feature ON/OFF would cover it all with the exception of audio volume input control with a level function considering they have volume knobs for pretty much everything else except the Guitar/Instrument dedicated plugin port. But they added the Level MIXER controls functions separate in the Stand Alone software which I didn't think of changing anything in to control the volume because everything else can be set by installing the drivers only. I just used the VST I Purchased. They separated those functions. If you are using Pod Farm 1 VST there is no Mixer option available, if you load the Standalone software it's there, but it's not that apparent if you buy it to use the VST like me to begin with because installing the drivers gives you and option to control "Everything else" when it comes to inputs controls and all that, there is no Mixer level options there until you load the Stand Alone Pod Farm 1 software". But even at that, the "Pad" feature turned on/off I thought covered my input volume since I never bothered with the stand alone software to see the selects to add +18 DB option for non active pickup guitars etc.., which the design is still a bit confusing to me because why have a "PAD" feature to turn on and off, when it basically makes things worse if you don't load up the Pod Farm 1 Software and go into Mixer and select the option to turn on +18 DB to begin with. If you don't know about it like me that is. And I read the manuals several times over and over. I also contacted their support, which was quick and helpful, but never really resolved my issue because the answer always came back "You need to turn off the PAD feature to increase the volume". But I will say this, since it's finally sorted out I'm liking the results I am getting using this device where the volume and sound are concerned, it's like someone turned on the lights so to speak. Although if I can afford to in the future I still want to upgrade my audio input device. I like the Pod Farm sounds, although I must confess, I use TH3 Overloud Full for my guitar sounds now and like them a lot better. That being said, Not knowing that I needed to load the Pod Farm 1 Stand Alone software "MIXER" options to begin with and changing that to +18 DB NOW, has really made the TH3 Overloud sound and work like it should along with other VST's also. It changed everything for me. I realized something today trying to a few things with Pod Farm 1 "Stand Alone" and this Toneport KB37. This may apply to the PodStudio KB37 as I think they are calling it now. I wanted to mention this in case it might help someone who may not know this and have a similar problem with audio input volume control as I have had. Here's the thing, while I mention that the "Stand Alone" version of Pod Farm 1 you can select "MIXER" and then turn on the +18 DB from that software area to increase your volume with your device using this Toneport KB37. 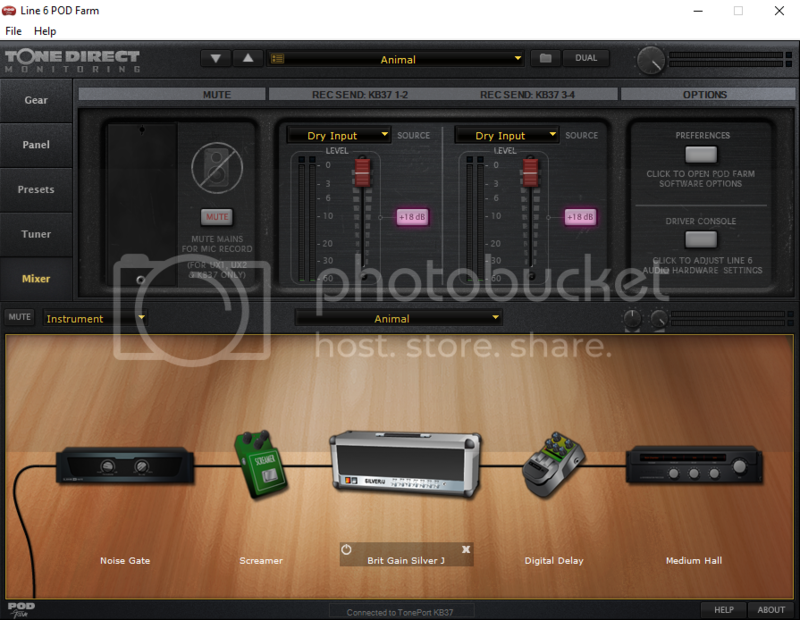 It works fine if you do that and just exit the software, BUT if you are using using the stand alone version of Pod Farm 1 and select "MIXER" and then select +18 DB and change to another preset that hasn't been saved with the +18 DB "MIXER" setting then whatever you use after that will not be using the +18 DB setting. I can't speak for Pod Farm 2, but the design of this volume input for my setup is seriously flawed to say the least. Since I don't really use the Stand Alone Pod Farm 1 and only the VST I just select the +18 DB In the Stand Alone MIXER and my Audio input stays at +18 DB, so it's no big deal unless you don't know about this. Either way, I hope this helps someone in a similar situation. Hopefully soon I can just purchase something like a Focusrite Device and get Pod Farm 2 which isn't tied to this Toneport KB37 so I can keep all my Pod Farm presets and FX packages that I purchased.